This TopSeller model comes with four 2TB SATA 6Gb/s 3.5" Internal Hard Drives and two 500GB SATA 6Gb/s 2.5" Internal Hard Drives for operating system. It also includes an Intel E5-2603 v3 processor, 8GB RAM, 720ix 1GB Cache RAID, four GbE ports, three I/O slots and two 750W hot-swap power supplies. 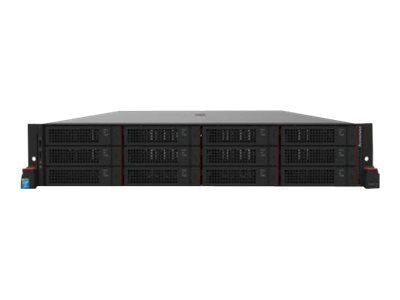 The Lenovo Storage N4610, a unified storage platform based on ThinkServer and Windows Storage Server 2012 R2 innovations, offers the flexible choice of storage protocols (iSCSI, SMB, CIFS, and NFS) and can provide required performance levels for the most demanding server applications while significantly lowering deployment and support costs. The N4610 features up to 72TB of internal storage capacity (raw) in a dense 2U rack form-factor, a Lenovo AnyRAID advanced RAID controller, Lenovo AnyFabric 4x Gigabit Ethernet (1 GbE,) network ports. More network connectivity options also are available (2-port and 4-port 1 GbE with RJ-45 connectors and 2-port 10 GbE with SFP+ or RJ-45 connectors) and I/O scalability with up to eight PCIe 3.0 slots. It can also be scaled up to 372.8 TB of storage with the optional Lenovo ThinkServer SA120 Storage Enclosure units (up to four units are supported). The N4610 is a great choice for your business, regardless of whether you are a first-time user of network-attached storage (NAS) or you are deploying advanced storage solutions. Memory: Up to 24 DIMM sockets (12 DIMMs per processor). Only RDIMMs are supported. Maximum memory: Up to 192GB with 24x 8 GB RDIMMs and two processors. This product is subject to our return policy. Please see our complete return policy for details. NOTE: The vendor allows returns within 30 days of purchase on products in the Network Attached Storage category.